WASHINGTON — No matter how the midterm elections shake out, Senate Majority Leader Mitch McConnell, R-Ky., has already won. The deal late this week that paved the way for the Senate to recess until after the midterm elections added three circuit court and 12 district court judges to an already historic number of conservative judges confirmed by the Senate since President Donald Trump took office, turning McConnell's quest to remake the federal courts from dream to reality. The Senate this term under McConnell has far surpassed the number of judicial confirmations of any Senate during the five past administrations: a total of 84 Trump appointees, including 29 to the circuit courts, 53 to district courts and two to the Supreme Court. Trump's nominees now fill a whopping 15 percent of the circuit court seats. The pace is particularly striking when compared with the term that preceded it: During the last two years of President Barack Obama's second term, McConnell allowed floor votes on only 22 of his judicial nominees. For comparison, Democrats confirmed 68 of President George W. Bush's nominees during the same time frame. McConnell has said his push to confirm a record number of young nominees to lifetime seats on the U.S. judicial courts will motivate GOP voters to keep the Senate Republican, and keep those confirmations coming. 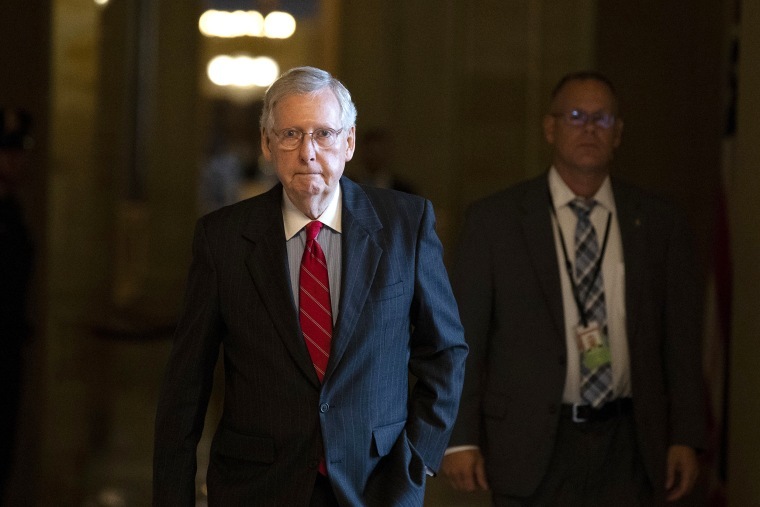 "Lose the Senate and the project of confirming judges is over for the last two years for President Trump," McConnell said in an interview with NPR. "That, I think, is a scary prospect to the people who like what we've been doing on the judge project and I hope will help us hold on to our majority." Republicans have had success with judicial nominees in large part because of a rule change by then-Senate Majority Leader Harry Reid, D-Nev., in 2013. Frustrated by GOP efforts to block Obama nominees, he changed the threshold to end debate and allow confirmation votes on federal court judges from 60 votes to 51. Because of the backlog that accumulated when Republicans controlled the pace of nominations for a Democratic president, Trump entered office with the ability to fill 112 judicial vacancies — more than twice the 52 vacancies that Obama inherited in early 2009. McConnell's commitment to confirm nominees came with another electoral bonus: vulnerable Senate Democrats running for re-election faced a leader determined to keep the chamber in session — and them off the campaign trail — through the month of October unless they could quickly approve a bundle of both judicial and executive branch nominees. Now, the votes that could have taken the rest of the month were cleared in the space of a few hours late Thursday night. In addition to the 15 judicial nominees confirmed Thursday evening, the Senate unanimously approved 21 executive branch nominees. The president got lifetime judicial appointments. Senators got three precious weeks to hit the campaign trail and fight for their political lives. Whatever the outcome Nov. 6, the total for McConnell's record-breaking term is likely to keep rising: When the Senate comes back to a lame-duck session in mid-November, he's looking to get roughly 35 more judicial nominations and a score of executive branch nominees approved before Congress wraps up for the year.